This funny feline and its owner have bonded through a peculiar game of their own design — and we must admit, it's superbly silly. 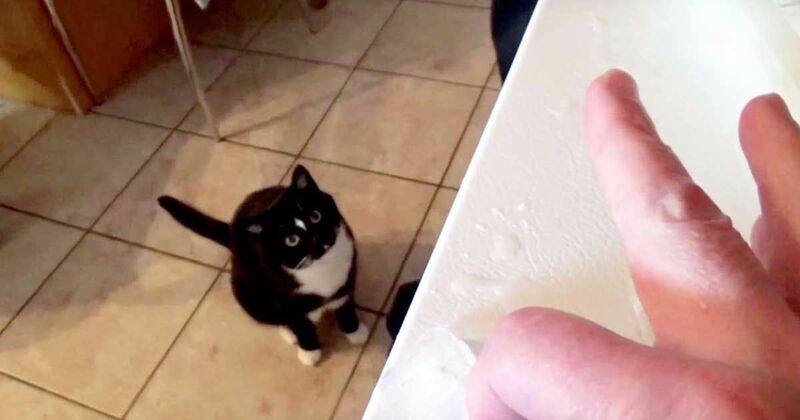 This tenacious black-and-white cat sits on pins and needles waiting for its owner to flick its favorite play thing through the air: ice cubes! It's as simple and crazy as it sounds, but it clearly makes for a thrilling game for the ninja-like cat who impressively tangos with the tantalizing icy projectiles and manages to skillfully catch a lot of them — a whole lot of them! This cat could seriously go pro as a goalkeeper. Next time you're looking for a game to play with your cat, try the Frozen Water Rocket Jump and Grab Game (sorry, we're trademarking that). It might just reveal your own cat's super ninja goalie skills. And if it doesn't, it's super cheap and there's no mess to clean up. It's a win-win! Don't forget to share this cat's skills with your cat, your friends and your fellow cat lovers.